42 mm stainless steel case, transparent back, screw down crown, 18-ct white gold bezel with Bulgari logo, sapphire crystal, blue dial with linear pattern design, the bottom half of the dial is cut out between the markers and around the seconds sub-dial exposing the movement base-plate decorated with a vertical Cotes de Geneve striped finish. Silver rimmed chronograph related sub-dials at the 3 and 9 o'clock positions, blue rimmed regular seconds sub-dial locatd at the 6 o'clock position, BVL 303 automatic movement chronograph and stopwatch with large central seconds counter, 30 minute counter sub-dial located at the 3 o'clock position, 12 hour sub-dial counter located at the 9 o'clock positionand continuous regular seconds sub-dial counter located at the 9 o'clock position, approximately 40 hours of power reserve, blue alligator strap, deployant buckle. 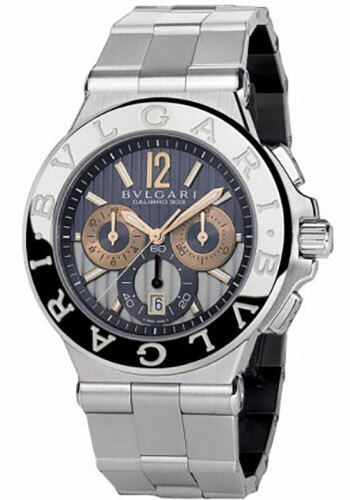 Water resistant to 330 ft.
42 mm stainless steel case, transparent back, screw down crown, fixed bezel with Bulgari logo, sapphire crystal, black and silver dial with vertical linear pattern design, BVL 303 automatic movement integrated chronograph with column wheel and vertical clutch, large central seconds counter, 30 minute counter sub-dial located at the 3 o'clock position and a 12 hour sub-dial counter located at the 9 o'clock position, approximately 40 hours of power reserve, stainless steel bracelet, folding buckle. Water resistant to 330 ft.